I never travel without… My camera! Me in 12 Words or Less: Sees the world through lenses – be that compassion, vision, or a camera. As a Photographer, I love capturing relationships, beauty, the special things that make people unique, and telling the story of what God is doing around me. I have been involved in youth and children’s ministry in a variety of capacities for the past 15 years. In recent years I have begun to intertwine photography and ministry into a cohesive and strategic duo. Since one of my favorite elements of photography is storytelling, images are a natural springboard into re-telling the greatest stories of my life: Redemption and Grace. I currently serve as the Coordinator of Patient Care Services at a local Pediatric office, as well as own and develop, “Captured”, my photography business. In my “spare time” I can be found outside; reading, trail running, or exploring downtown Greenville. I also enjoy visiting whimsical small towns, local coffee shops, and spending time with people. International ministry is an influential and life-changing event in the life of a believer. Opening their eyes to a world beyond their own circle or culture, it becomes a greenhouse for new perspectives, learning God’s faithfulness, a deeper level of growth, a greater understanding of God, His heart for the lost, and His love for His Church. Standing beside other believers and worshipping God together, but in a language completely foreign to you begins to work within you this grasp of God as a cross-cultural God who works in a relevant and real way to each person and delights to hear praises sung to Him in every language, style, and voice. There is an over-riding picture that is so much bigger than “God loves me” or “God bless America” because “God so loved the world He gave His only Son.” Seeing this as a reality opens your eyes and heart to a new love for the people around you, and an intense love for our God who is so big, so real, and so full of love for every people and every culture. 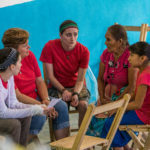 Another aspect of short-term international missions is the opportunity to partner with local believers to provide encouragement and support to the ongoing ministry they are engaged in. It is a joy to be able to serve with them, provide them with tools for continued ministry, and help hold up their hands when they are weary. Giving the Gospel never gets old, and we have a whole toolbox of unique ways to share the story of Redemption. But despite every tool or method, the message simply gains authenticity and credibility by “giving our lives away.” Just as Christ loved us and gave Himself for us, we are able to live out Christ in a way that transcends culture and language barriers – by loving as Christ loved and giving as He gave, the Gospel is lived out in its simplest and truest of forms.